Due to US Postal regulations, chemicals cannot be shipped via Air or through the US Postal Services. Therefore they can only travel to the 48 states via UPS Ground. Shipping advice: One bottle of a chemical shipped via UPS will cost more than the bottle. It is best to get multiple bottles if that is all you need to order. Super Brite is a fast-acting bright copper finish to solder. Simply rub on, then wipe off and polish. A rich black patina that works equally well on lead and solder beading. Apply with small brush, rinse off & polish. This flux is the first truly odorless, non-smoking flux for copper foil, lead and zinc came. Works with traditional and lead free solder, and produces a smooth, shiny surface. 8 oz. size. 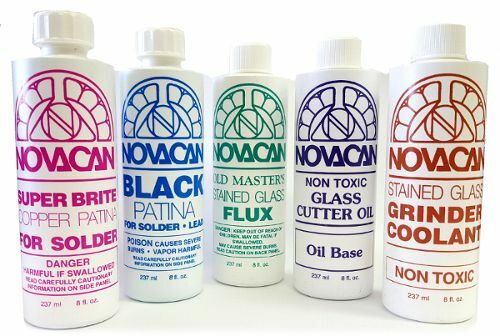 Use flux to create your project, NeutraClean to clean it up, and Liva Polish to protect it! 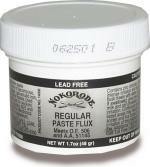 A non-liquid paste flux, works well on just about everything, brace bar, zinc, etc. Will not freeze or decompose. No odor. Lead free. Recommended for use on all solder alloys including all lead free solders. Apply a thin film of finishing compound to dry to haze. Buff seams with Metal Magic pad and be amazed at how blackened the pad has become! 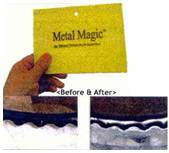 The polymer particles in the Metal Magic binds to the metal, sealing and protecting your project. When done you can wash the pad with soap and water and reuse again and again. Size: 4.5" x 6" pad. Perfect for removing unwanted oxidation and flux residue. Brass Wool that is chemical resistant and will not rust when it comes in contact with flux. Patina Buddy will not scratch your glass when polishing your solder seams.